This is a real brisket. Are there two groups of people more determined to annoy each other than meat eaters and vegans? Whether it’s a carnivore enjoying a blood-rare steak outside of a vegan festival or a group of vegans protesting outside a meat-focused restaurant, the two groups seem determined to just bug the hell out of each other, with no middle ground in site. 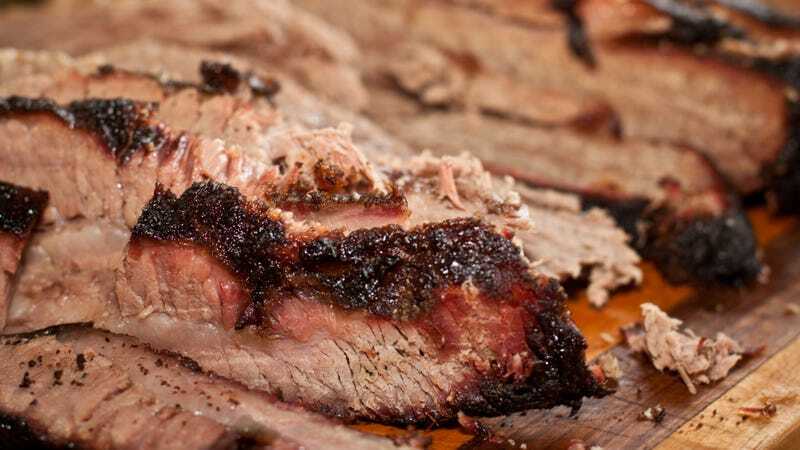 The latest add to this forever feud is a dish by Hollywood writer Kevin Biegel, who made a realistic (but vegan) brisket out of “jackfruit, seitan, miso, beer, Franklin BBQ sauce,” says The Washington Post. Biegel’s meatlike brisket has inspired a heated online debate, with strong responses on both sides. The meat-eaters wonder why vegans create things that look like meat (with the typical “why do humans have canine teeth if they’re not meant to be omnivores?” comments, etc. ), while vegans explain that they don’t eat meat, but they’d still like to enjoy the experience burgers and such. Biegel tells the Post that he’s not even vegan, but became a vegetarian after a heart attack 10 years ago. What’s the best way to use up leftover rotisserie chicken?